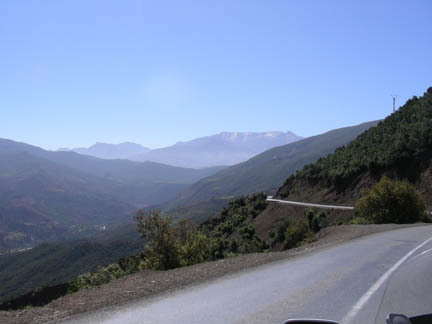 South of Marrakech there is the range of mountains known as the High Atlas (the middle Atlas mountains are north of Marrakech). 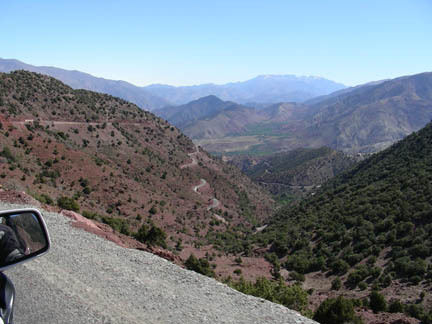 There are two passes over the High Atlas, one southeast of Marrakech called Tizi n'Test, the other southeast and called Tizi n'Tichka (Tizi means "pass"). 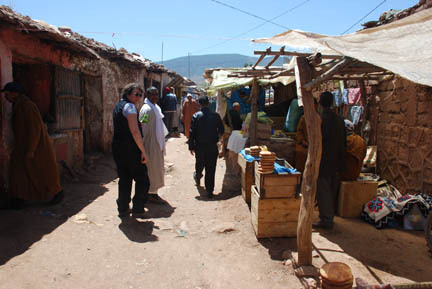 We are in Taroudannt on the south side of the Atlas and headed over Tizi n'Test towards Marrakech first. 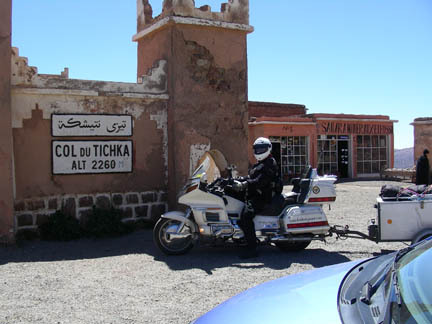 Later we will cross back over on Tizi n'Tichka. 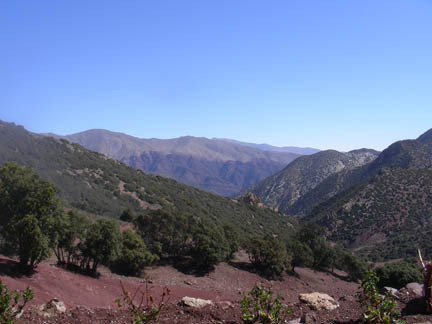 We have been traveling up the Sous Valley, a wide agricultural valley that is an important source of food for Maroc. Those are Argan trees in the background (mentioned on page Al-Jadida) but no goats in them here. The marker says it is 165 km. to Marrakech. The mountains are hidden in the clouds in the distance. 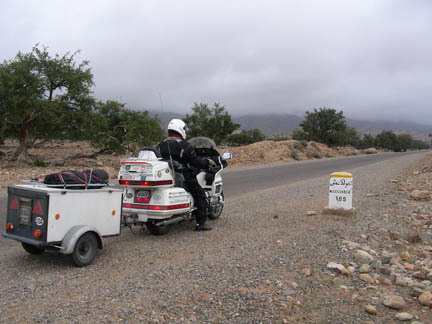 We had been warned by the GoldWing Club of Maroc that this road was steep windy and one lane, with two way traffic. What they didn't say was that it would be foggy and a light rain! Visibility was about 100 feet. We met two trucks and about 5 cars, and got passed by a Taxi driving without his lights on! 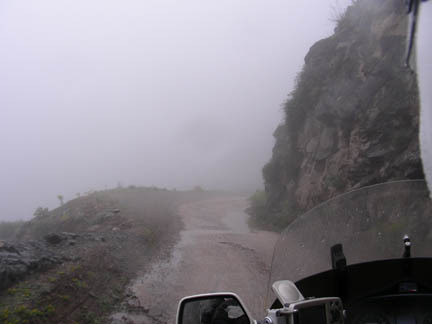 It wasn't the worst road we've been on but by adding the fog it became the worst road experience we've had. My top speed was 25 kph (about 15 mph). At this rate it was going to take all day to get to Marrakech. Then at the pass we stopped and had a soda and rested. The elevation is 2100 m. (over 7,000 ft.). 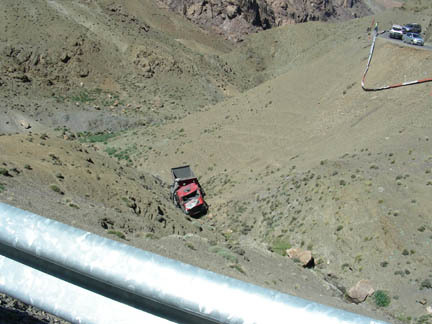 The pass is well named, it is a real "test" of one's driving skill to get over it! Then the other side of the pass looked like this. 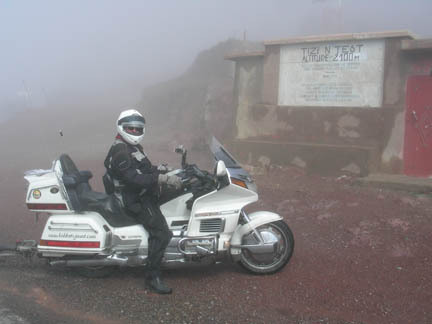 The fog and rain was only on the south side of the mountains. We had a better road, one and a half lanes and better surfacing. But still very curvy. You can see the road in the upper left, center and lower right as it heads down into the valley. 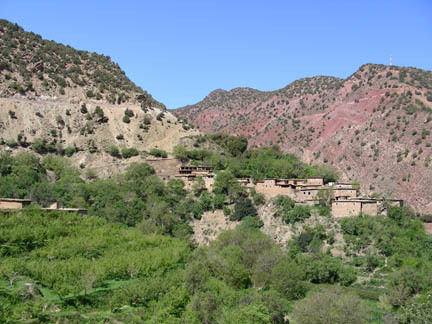 Berber villages, made of mud and stone, perch above the little bits of arable land in the valley bottom. There were a dozen or more of these villages along the route down from the pass. Many of the women had been out picking the grass and loading it onto their back to carry it home. I wondered if these people are too poor to even own a donkey. 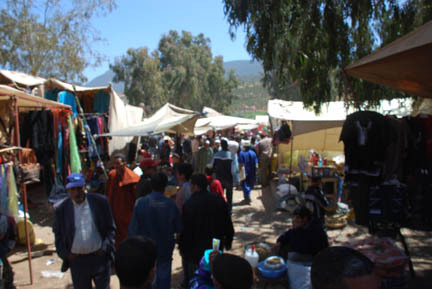 At the town of Asni there was a weekly market being held. We decided to visit it and pulled off the road near the entrance. We were immediately "adopted" by a guide who spoke excellent English. We had been warned about "guides" at the Marrakech Medina who would lead you to the stalls where they got the highest commission on any purchases you made, and not let you go to places where you wanted to go, but we followed him anyway. He led us around most all the market, explained things and didn't seem to have any favorite stalls. This is a spice merchant. 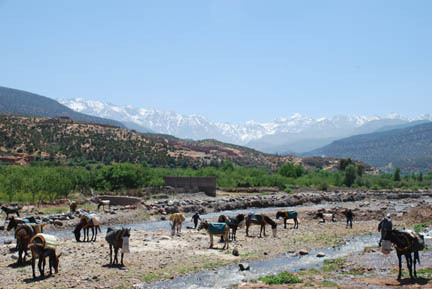 Out back of the market, in the bed of the river, is the parking area for the donkeys that have brought the merchandise down from the villages that are perched along the sides of the valley. And with the snow capped High Atlas mountains in the background it was very scenic. These are the only "trucks" that can negotiate some of the trails into the mountains. 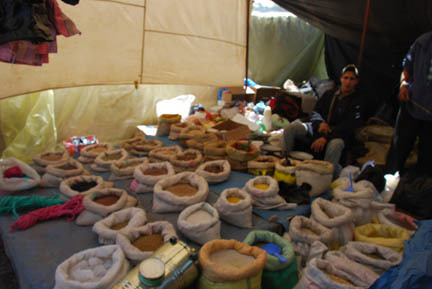 He led us into the food area where bread was being baked, tajine cooked, and tea served. Our guide, Elmarhouli Mohamed, is to the right of Kathy. He invited us to have tea with him. This is usually the start of the negotiation period of a purchase but he hadn't shown us anything particular yet. So we went into one of the small buildings on the left in the picture above and he ordered tea and served it. 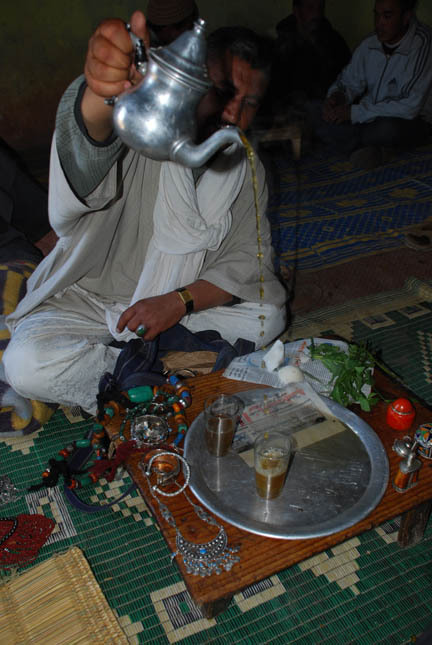 It is often called "Berber Whiskey" because this is as close to alcohol as a Muslim comes. It is very hot, very sweet and has lots of mint in it. It is poured from a height to aerate the tea and release the flavor of the mint. We left the market, said good-by to Mohamed and rode into Marrakech. 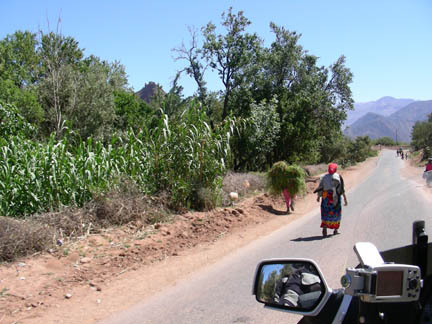 The Tizi n'Tichka is a much better road, it is two lane most of the way, and no less than one and a half anywhere. 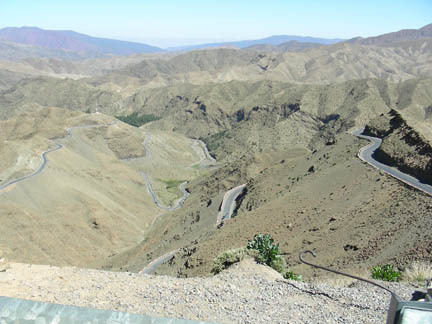 It runs southeast from Marrakech over the High Atlas to the town of Ouarzazate and the Sahara Desert. 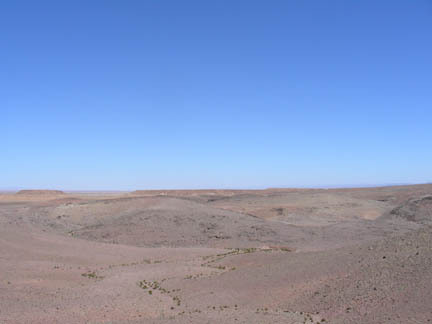 Marrakech is on a flat plain at about 2,000 ft. elevation and the pass is about 7,400 ft. Much of the loser slopes on the north side are forested or farmland. As one climbs the greenery stops and rock is the predominant feature. And the roads begins to wind around the slopes gaining elevation quickly. Not everyone made it to the top and back down safely. At the top we stopped and had a soft drink and bought some more souvenirs. 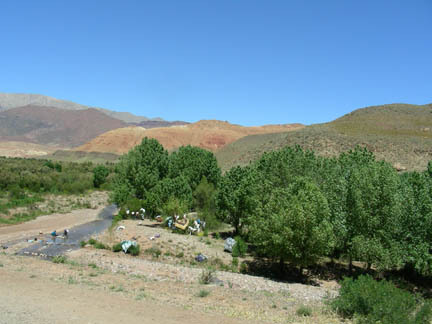 We followed a small river valley down the south side where it was laundry day for the local women. And then the river disappeared and we entered the desert. A sea of rock and dirt with the occasional village of mud houses. We are in the Sahara.